This supplement of Rocks Fall Games is 28 pages long, 1 page front cover, 1 page editorial, 1 page ToC, 1 page of SRD, leaving us with 24 pages of content, so let’s take a look, shall we? So what exactly is this? Well, as the frame narrative explains, the information herein was extracted from the notes of necromancers – both the note on why this notes are preserved as well as said necromancer’s introductory text of megalomania set a nice stage for the crunchy content, for herein, we are introduced to a wide variety of zombies, from CR 1/4 to CR 11 – all of which come with their own pencil-drawn b/w-artworks and accompanying, aptly-written fluff-text that guides us like a red thread through the creation of the undead menaces. 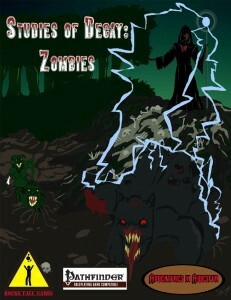 Starting off with CR 1/4 undead plague rat zombies, it becomes apparent that more than just standard zombies roam these pages and via giant crab zombies, zombified goblins, manticores, wyverns, shambling mounds, dragon turtles, ogres, dire crocodiles, griffons and ankheg zombies up to rabies-infested dog zombies, to dire bat and treant plague zombies as well as a variety of fast zombies (trolls, ettins and girallons) are here for your perusal. EDIT: Flawed CRs, for example, have been fixed. On the weird side – the fluff mentions that the writer has killed a purple worm zombie with phantasmal killer, which seems unlikely – assuming at least Int 18, the worm at fort +17 would have had to fail quite badly AFTER botching the will-save. Nitpicky, I know, but still – its minor incongruities like this that break my immersion, which the prose managed to otherwise maintain quite well. Also: Where is the purple worm’s swallow whole ability? The zombie-template specifies that attack-based qualities are retained and swallow whole fits the bill and while there seems to be some ongoing controversy regarding this one, I would have loved to see it. Still, not featuring negatively into my rating. The final entry of this supplement provides us with the Horror of Weavestorm, a kraken-zombie at CR 9 – damn cool! Among the zombies herein, we also get the new bile zombie-template (CR +1), which, with its digestive acid and breath attack is applied to a gargoyle zombie -think acid-zombie à la Left 4 Dead’s Belchers. Editing and formatting are very good, improved now with statblock glitches addressed. . Layout adheres to a parchment-style 2-column full-color background and the b/w-artworks are nice to get at this low and fair price-point. The pdf comes in a massive 4 versions – two in full color and 2 more printer-friendly iterations. Both versions come in regular quality and in HQ-versions for those with good printers – nice! Kristofer Konkel and Charles Marleau of Rocks Fall Games has created a nice supplement that wraps statblocks in a cool frame-narrative that should prove to be rather inspiring for DMs: The tactics of the nameless necromancer are rather sinister indeed and prose-wise, this pdf actually is rather fun to read, so that’s definitely a plus. What I don’t get is that there are so many different simple templates/modifications for zombies out there – why does this pdf only use two of them? Why no alchemical or gas-burst zombies? What about relentless ones? Adding one or two here and there would have increased the value of the pdf and provided more variety for DMs to choose from – the new template is a step in the right direction, but why hasn’t it been applied to the ankheg? Or substitute cold for acid and apply the template to the ankheg-zombie for a nasty surprise if the PCs guard versus acid and get hit by another energy…. With the statblock glitches now purged, I can settle for a final verdict of 4 stars -a promising start for Rocks Fall Games’ new series. You can get this nice supplement here on d20pfsrd.com’s shop and here on OBS!